Our first fragrance collection containing 100% organic essence and globally sourced natural extracts. We travelled the world to bring you back the most precious natural extracts, hand-picked and harvested with care, blended them with 100% organic and community fair-trade perfume base to bring you our finest global fragrance collection yet: the Scents of the World collection. Experience one fragrance on its own or blend two together to create a truly individual scent. From the warm and exotic to the lush and the exhilarating, Scents of the World transports you to exotic and far away places. Madagascan Vanilla Flower ~ "Off the coast of Africa, the fragrance of Madagascar Island Vanilla travels on a warm, African breeze"; with amber, frangipani and vanilla. Amazonian Wild Lily ~ "Discover an oasis of fresh lilies in the Amazon with Amazonian Wild Lily"; with iris, orchid, papaya and Brazilian lilies. Japanese Cherry Blossom ~ "Indulge your spirit of adventure as you pick Japanese Cherry Blossom in Kyoto"; featuring Fuji apple, magnolia and cherry blossom. Indian Night Jasmine ~ "In India, wrap yourself in Indian Night Jasmine as it blooms under the moon"; with sandalwood, violet leaf and orange blossom. Atlas Mountain Rose ~ "In Morocco, the scent of hand-picked Atlas Mountain Rose fills the air"; with citrus, spices and rose extracts. 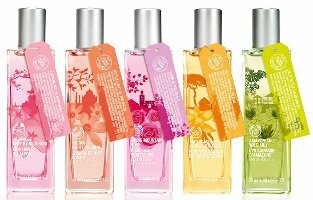 The Body Shop Scents of the World collection will be available in 50 ml Fragrance Mist and in matching bath & body products. I’m coming to the conclusion that the people who come up with these world themed perfumes don’t realize that Japan has flowers besides cherry blossoms. I’m assuming that’s the same JCB that TBS already sells, just repackaged. They also already sell a Moroccan Rose and a vanilla, and the Indian Night Jasmine sounds not unlike their Neroli Jasmin. Is TBS running out of ideas? Could be that these are natural versions of existing scents — I’m surprised, given their brand positioning, that they haven’t made more of an effort in the natural arena. These actually sound quite nice, and Body Shop’s products are affordable and ethical. I haven’t loved every scent they’ve come out with, but I do like the idea of matching scent, shower gel, lotion, etc. and will be on the lookout for these.